Image caption The Bangladeshi community says that parts of Bahrain are "danger areas"
Some Bangladeshi expatriates in Bahrain say they have been forced to take part in pro-government rallies. They have told the BBC that their enforced participation has provoked retaliatory attacks from the country's majority Shia population. A Bangladeshi community leader said that two expatriate workers had been killed on Tuesday and shops owned by Bangladeshis were attacked. 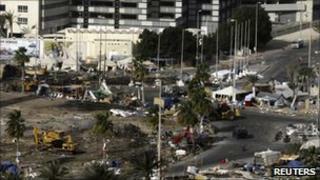 The authorities in Bahrain have not commented on the claims. There are 100,000 Bangladeshi expatriate workers in Bahrain, more than 300,000 Indian expatriate workers, 60,000 Pakistanis and about 30,000 Nepalis. India and Nepal both say that their citizens are safe, but advised them to keep a low profile. Pakistan says there are no plans to repatriate its nationals despite reports that a Pakistani was killed and four others were injured by protesters in the capital city, Manama, on Sunday. Correspondents say that the position of Bangladeshis and Pakistanis in Bahrain is especially dangerous because they are Sunni Muslims caught up in what is partly a sectarian conflict. Bangladeshi expatriates estimate that about 50,000 Bangladeshis are living in the "danger area" in and around Manama. They say that many of these people are shopkeepers who have not been able to leave their houses for three days. Fazlul Karim, president of the Society for Bangladeshi Workers in Bahrain, told the BBC Bengali service that some expatriates in the capital had recently been forced to take part in pro-government rallies and had afterwards been attacked by Shia protesters. He said the only thing that all expatriates wanted was better security so that they could leave their homes in safety and return to their jobs. The authorities in the island state have not commented on the claims, although they have repeatedly stressed that they will do their utmost to protect innocent expatriates caught up in the violence. But Bangladeshi community leaders say that the security forces are nowhere to be seen in many parts of Manama. "We are a little worried," Mohammed Sayeed, President of the Bahrain Bangladesh Society said. "If the situation gets any worse thousands of people will want to leave."